Flights have been delayed as a massive dust storm enveloped the Phoenix area in Arizona. The storm blanketed downtown Phoenix by nightfall with gusts of more than 60mph rapidly moving the dust cloud to cities of Avondale, Tempe and Scottsdale, the National Weather Service reported. It drastically reduced visibility causing flight disruptions, highlighting the need for an appropriate travel insurance policy, including adequate cover for any delays. 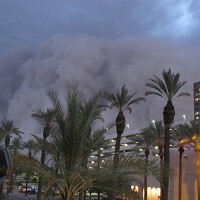 Towering over skyscrapers, the wall of dust seemed to be roughly 50 miles wide in some spots, KSAZ-TV reported. The violent dust or storm, which typically occurs in Arizona between mid-June and end of September, toppled trees and caused power outages for thousands of residents in the valley. Parts of the state were also under a severe thunderstorm watch.